Echinoderms are a conspicuous and diverse component of the invertebrate fauna of the Great Barrier Reef (GBR) and have been reviewed in a number of taxo-nomic and biogeographic studies (see Additional reading). Most echinoderms from tropical Australia have a broad distribution in the Indo-Pacific Ocean. The 630 species of echinoderms recorded from the GBR are from the five classes as follows: sea stars (Asteroidea) 137 species; brittle stars (Ophiuroidea) 166 species; sea urchins (Echinoidea) 110 species; sea cucumbers (Hol-othuroidea) 127 species; and feather stars (Crinoidea) 90 species. Echinoderms are a conspicuous and ecologically important component of reef communities. They are often the dominant organisms on the sea floor and this is particularly true of tropical Holothuroidea, the elongate sausage-shaped animals (e.g. Holothuria) seen on reef flats and sandy areas. 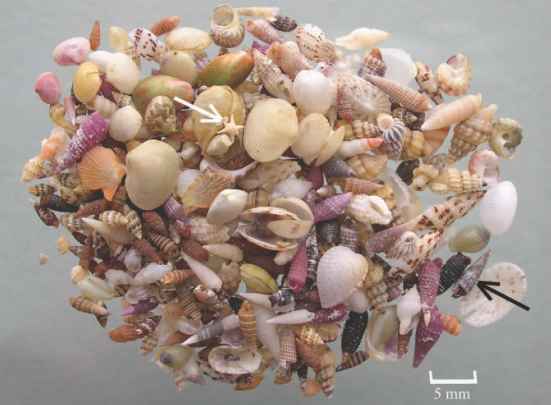 Some of the more common echinoderm species on the GBR are illustrated in Figs 26.1-26.8. The body symmetry of adult echinoderms is secondarily radial and based on pentamery. There are usually five radii (e.g. arms of sea stars), although multiarmed (6+ arms) asteroids and brittle stars are common and some burrowing sea urchins have four radii. Echinoderm classes are easily identified due to their distinctive body profiles. Asteroids are star-shaped with the arms (five or more) tapering from the disc (e.g. Linckia, Nardoa) or a cushion-like pentagon shape lacking arms (e.g. Culcita) (Figs 26.1; 26.2A-F). Holothuroids by contrast are elongate (Figs 26.2F-I; 26.3-26.5). Ophiuroids have a round central disc and slender flexible arms that are sharply set-off from the body (Figs 26.6, 26.7). Their body can have a simple (brittle stars or serpent stars) or branched (basket stars) profile. Echinoids have a rigid, globose body (= test) covered by spines of varying length (Fig. 26.8A-F). Crinoids have an array of feather-like arms that range in number from five to several hundred (Fig. 26.8G—I). Some aspects of the biology of echinoderms, for instance reproduction, are general to the phylum, while other features such as feeding are class specific. Class specific features are dealt with below with a focus on species that occur on the GBR.